With wearable cameras it's easy to get caught up on if it's recording, where it's pointing and how much batter life is left, but the wearable camera FrontRow makes sharing experiences easier. The FrontRow has 2 cameras – a main 8MP f/2.2 camera and a 5MP f/2.0 reverse camera – and a 1-watt speaker. Both cameras have a resolution of 1080p up to 2.7k at 30 frames per, but only the main camera has an image stabalizer. FrontRow features 2 microphones which have been optimized for concerts and performs well in loud environments, but may have some distortion in high wind situations. "We performed extensive testing in concert environments and tuned the audio accordingly," Joe McMahon, of Ubiquiti Labs, said. There is no support for external microphones. The 1.96 in display with 640 x 572, 327 ppi resolution on the FrontRow help for easy navigation and viewing images and video. FrontRow runs on an Android system and contains 32gb of storage with 2gb RAM running. The battery life allows up to two hours of video recording or streaming, six to 16 hours in story mode (depending on settings) and an incredible 50 hours standby time. For those who are looking for longer recording or streaming, the FrontRow has a USB type-c with quick charge that can be used while recording. This can help get a much longer recording/streaming time when using FrontRow together with a portable charger. 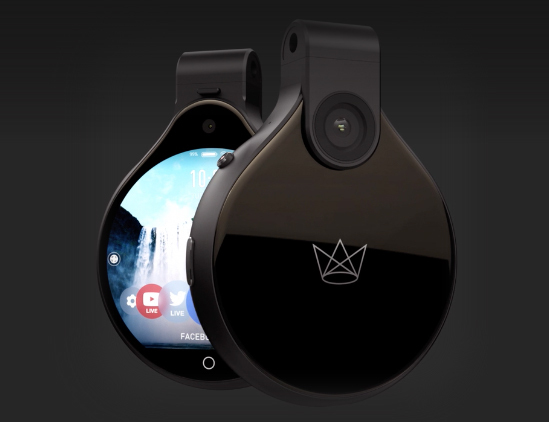 For those looking for a wearable for livestreaming to social media, FrontRow is able to connect to devices with FrontRow app available in the Apple Store and Google Play. "Within the iOS FrontRow App there are options to stream to Facebook, YouTube, Twitter, or through a custom RTMP stream, " McMahon said. "We do not support Instagram because they have not released an API." For convenient transfers, FrontRow is able to connect through Bluetooth or WiFi to download or share media. Although FrontRow has a fixed focus lens, it also has both and Optical Image Stabilization and Electronic Image Stabilization to get clearer photos and steadier video unlike other wearables that are almost impossible to get a steady image. The Optical Image Stabilization varies the path to the sensor neutralizing most the shaky movement while the Electronic Image Stabilization crops the image to a smaller size to reduce the field of the shaky image. In low light situations FrontRow performs at par with any wearable on the market. McMahon said that FrontRow will receive regular updates that can be seen on FrontRow's Community Forum. "We look to our community to learn about how people are usin g our product and what features they would find beneficial," MacMahon said. "We take note of these suggestions and incorporate these ideas into future updates." FrontRow is available in Black and Rose colors and cost $399. It can be purchased through FrontRow.com.